"I do solemnly swear that I will support and defend the Constitution of the United States against all enemies, foreign and domestic; that I will bear true faith and allegiance to the same; that I will take this obligation freely, without any mental reservation or purpose of evasion, and that I will well and faithfully discharge the duties of the office on which I am about to enter. So help me God." For the sixth time, I have been blessed to stand up before God and Country and promise to defend the United States Constitution. I am ready to hit the ground running with my ideas to advance both the Commonwealth and the nation. In the 115th Congress, we have the opportunity to create lasting, positive change to restore confidence in America again. Just this week, Congress has taken the first steps towards repealing and replacing ObamaCare with a plan that will maintain coverage while allowing more choices, more competition, and lower prices. The House also made moves to get rid one of the biggest burdens to small businesses and manufacturers. We passed the REINS Act, which will require Congressional approval of every new major rule issued by a Federal agency, before it can be enforced. In the first 200 days of the 115th Congress, we will be working to implement an agenda that will get our budget on track, reform the tax code, reduce regulatory burdens, and get those on welfare to work. These are big, bold ideas that will allow Americans to prosper. 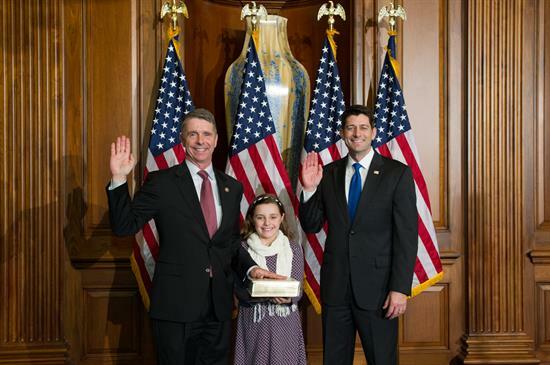 I am fully dedicated to representing the constituents of the First District. I will continue to work hard to ensure that Veterans receive the benefits they deserve; that we bring jobs back to the hard working men and women of Virginia; that we preserve and build our military strength; and, that we meet the needs of our hard-working federal employees. I am here to serve you and please never hesitate to let me know the issues that are important to you. Americans are tired of the same old Washington as usual, and you spoke loud and clear to say the current way of business is unacceptable. I want you to know that I hear you, and I pledge to fight for the principles that make this nation so great. Three Republican senators try to cut half of State Department embassy security funds -- I guess they have forgotten all about Benghazi. Three Republican Senators, including two former presidential candidates, have introduced legislation that will cut security, construction, and maintenance funds for American embassies throughout the world unless President-elect Donald Trump moves the American embassy in Israel to Jerusalem. The bill has been introduced by Sen. Marco Rubio of Florida, Sen. Ted Cruz of Texas, and Sen. Dean Heller of Nevada, as The Intercept reported on Wednesday. Although Congress passed a law in 1995 requiring the American embassy to be moved from Tel Aviv to Jerusalem, the three presidents who could have been required to implement that law (Bill Clinton, George W. Bush, and Barack Obama) invoked a waiver that would allow them to postpone doing so on national security grounds. Because moving the embassy to Jerusalem is widely believed to make a two-state solution impossible, such a move has been viewed as dangerous to peace and stability in the region.